Crumb32U4 V1.0 is a versatile and very compact/small (just 41x18mm size!) 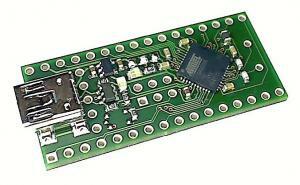 microcontroller module with the ATmega32U4 microcontroller with integrated USB 2.0 full-speed/low-speed device module. All microcontroller signals are available on pin headers. A selectable XTAL crystal is included. The module will be shipped with a USB HID keyboard sample application. Open a text editor, connect the module to USB (it will be recognized as USB keyboard and does not require any additional USB drivers) and see the text message coming from the module in the text editor! The example is based on the latest version of the LUFA Leight Weight USB Framework for AVR and is available for download here. The module is shipped without preassembled pinn headers, since everybody has different preferences or requirements. A Connector Kit with a suitable set of pin headers and receptacles can be ordered optionally. The crystal is preassembled, see infosheet for details.